Poo Bear’s impact on pop culture is undeniable. Having crafted hits for artists as diverse as Sam Smith, DJ Khaled, Chris Brown and J Balvin (not to mention songwriting and production credits on the bulk of Justin Bieber’s chart-conquering Purpose album), it was only a matter of time before he launched an artist project. Poo Bear Presents: Bearthday Music drops on April 27 and it’s a genre-hopping collection of bops with a staggering lineup of featured artists including Justin, Jennifer Lopez, Anitta and Zara Larsson. I recent spoke with Jason Boyd [his real name] about the ambitious endeavor, and he opened up about the album’s innovative, streaming-friendly format as well as the task of bringing together so many big names. Poo Bear also explained the long journey of lead single, “Hard 2 Face Reality,” and gave some insight into future collaborations including potential cuts with Mariah Carey, Jennifer and, you guessed it, Justin. Find out more about the man behind the music in our Q&A below. Why did you decide to launch your artist project now? I just feel like now is the right time. I feel like my name is a little bit more familiar than it was before. You know, my music won’t get lost as fast. I know that a lot of people still don’t know who I am, but I just feel like I’m in a better place right now to put out music. Not even as an artist trying to sing, I’m not doing this to become a singer. I just really want to put out records that I’ve written that I love. I plan to do it every year like a birthday. It’s a vehicle for new artists and established artists that are in between their albums. I just feel like now is a great time. I feel like people are consuming music on a larger scale, more than they’ve ever have in the history of music. I feel like it’s a great time now to start my Bearthday Music saga. I’m not forcing it, it just feels right to me. Is there a theme to the album or is it just a collection of your best songs? I really want to put out music for every genre, you know? I didn’t want to be locked in to a certain category or have to be listed as urban music. I just wanted to put out music for all genres and for all races around the world. I just want it to be the best. Like if I’m gonna put out a reggaeton record, it’s gonna be the most amazing… it’s gonna be my favorite sounding reggaeton record, which I have coming out with J Balvin. I just wanted to do every genre and that was the theme. The theme was, let’s attack different genres and just make the best music that we love in that genre. Then that way it’s not like you just turn on my album and you just have a bunch of down south rap music. My goal is to get on all these playlists. I want to get on the Latin playlist. I want to be on the Pop playlist. I want to be on the Rap Caviar. I did these songs to really spread out and just literally sink into these different genres. I just want to put out progressive music that people enjoy. It’s clever given that the album is kind of defunct. Exactly. So what I did was, I just created a playlist album, and that way it’s really scattered. I just wanted to put out great quality music. People’s attention span is short now. It’s just to be able to have these different genres. 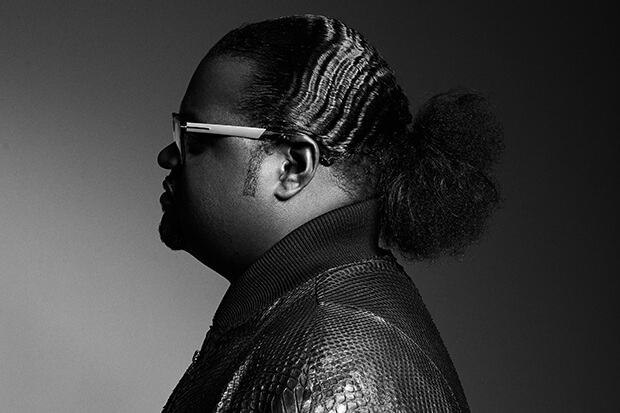 Even if they don’t consume it all at one time, I’m hoping that they will collectively hear it from different playlists and then be able to just put it all together and say, “Oh wow, this is Bearthday Music.” This is Poo Bear. The tracklist is insane. Did you start with a wish list of people you wanted to collaborate with? I didn’t really have a wish list, more so than I just had a couple records that I had started with my friends and then I was like, “Oh, it would be amazing if they would allow me to put this on my album.” That was a process within itself, you know, just going through that with the labels. Of course, the artists, they have big hearts, but they don’t understand the logistics behind it. So, thank god we got through it. It didn’t start off with a list more so than it did with me writing down ideas of songs that I had already created with my friends and saying, “Okay, cool. Out of these two records that I did with this artist, I would love for this song to be on my album. I would love to finish it and polish it up.” That was the vision for it. I wasn’t even sure if I would be able to pull it off. Thank God I was able to get all my friends on the album, but it was a work in progress thing. Sometimes another person might pop in my mind. I’m like, “Oh, it’d be really cool, you know, if Skrillex could work on this.” So it wasn’t really a wish list more so than it was just people popping up in my mind and the records that I had already started with those artists. “Hard 2 Face Reality” was one of those records you already started. I remember hearing the demo a couple of years ago. Yeah. You probably heard a snippet of it three years ago. It was just a piece of Justin Bieber’s verse, and then a piece of my verse. We both, me and Justin, both felt like it was a timeless record and it did good on SoundCloud. It did like 20 million streams. It stuck out, out of all the songs that were on SoundCloud that we did, it stuck out. We always had a plan to never to let that song die, because it was a snippet and we never wanted to give the whole record away. Then I ran into Jay Electronica’s manager and he got on board and we changed the beat up and finished it off. We were always really confident about that record, even with the snippet. It was just for us. Certain records are timeless, and it’s just a matter of getting them ready and making sure that it doesn’t sound dated. We all feel like it’s a special record. Was that originally recorded for Journals or Purpose? It was recorded before Purpose, actually. After Journals, but before Purpose. Yeah, we did that in Toronto, and we finished it in LA recently. Jay Electronica cut his part in Detroit. Is there going to be a video? It feels like a big song. Thank you. You know what? We’re almost at a place where we love a treatment, so it should be a video, a really nice video. We definitely need to put out a cool video to support that record. You also have J.Lo on this record. How did “Put Your Lovin Where Your Mouth Is” come together? It was just a record that me and her, we just started. We had cut a couple records with Skrillex and I played her this idea for the record and she loved it so much. We cut it and then her Vegas show started. I always loved it. I hit her up and I was like, “Hey, do you mind if I put that record out on my album?” She was like, “I would love that.” I love J.Lo. We’ve been working. We got a couple of records that we have in the bag, one special one that I am so grateful that she wants it for her project, but her album is not coming out for a while. What’s your creative process like? Do you start with a beat or an idea? Well, with chords. You start with chords and then you have melodies. For me, it’s like the concept is the most important thing. Your chords, you have a concept and then from there, you just support the main idea, the concept. I always start with the chords. If I could move your emotions and makes you love a record without any beat or any drums, or any cool futuristic sounds, then I know that we have a hit record and I could dress it up however. Put a tuxedo on it, could put overalls on it, you know what I’m saying? That’s interesting because a lot of people get caught up in trends. Yeah, and the beat. Those are the records that last for, you know, a month. If the sound is not the coolest or the next thing popping or trending, then that sound, that song immediately becomes dated. It’s just making amazing music that moves your emotions. That becomes timeless because you can’t take that stuff away. Beats and all that get old, you know? Songs and melodies don’t ever die. Is there a difference when you go into the studio to record a song for yourself as opposed to making a song for Justin, for example? Yeah. With me, I’m just sitting in the main room with a microphone. Justin is there, then we’re going back and forth. He’s going in the booth, or he’s putting down melodies, I’m putting down melodies and we collab. It’s just, for me, I’m just sitting in the room with a microphone. I don’t like going in the recording booth at all. I like just to keep the energy in the room. It’s strange because they created this separate room and you have to go and recapture this energy that you just captured in the main room. It’s just different. The room is dead, the sound is dead. For me, I just like staying in the main room and capturing the energy, as I’m creating it. I like to record as I’m creating. I don’t write down anything. I haven’t written down a song in over 12 years. I’m just creating and recording. Like as I’ll think of it, I’ll record it. I just skip the process of writing. If I’m thinking of it and I love it and I sing it, it doesn’t make sense to write it down. Just record it. What’s the difference? A lot of people miss out on great moments because they’re writing and they’re not living it. You collaborated with Anitta, Juanes and J Balvin. When did you discover a passion for Latin music? I think about three and a half years ago, I kinda just had an idea. Like, you know what? I wanna go in different areas of music that you wouldn’t typically see a black guy. I was like, I really want to break in to the Latin market. My manager Scooter Braun introduced me to J Balvin three years ago and I worked on Energía. That did really well, and that opened the door for me. I would have never been able to predict me being a part of “Despacito.” That kind opened the door completely. You look up now and every label is signing a new Latin artist. Everybody’s trying to recapture “Despacito.” I kinda just saw it and I just wanted to be a part of it three years ago, before it had taken off. What’s going to explode next? I’ve really been kinda diving in to the Indian market, man. I think it’s about time for the Indian market to fuse with some English and at the same time… I think K-pop melodically, sonically, and lyrically could be better but I think that Indian sound is so crazy and special. I think that with the right song that blends Indian sounds and western music, I think it’s gonna be explosive. It’s gonna feel organic. It’s gonna feel right on time. I’ve already worked with a couple Indian artists. I think it would sound awesome. There’s also a lot of new talent on your album. How do you find them? Some of them found me, and I guess I just build relationships with them. Like, Elvana’s from Albania. They reached out to me through a mutual friend, and I worked with her. They hired me to work with her and I loved her voice and I loved her as a human. It just kept growing, and building a relationship and then it only made sense for her to be on my album, naturally. Then, Sasha Sirota, he’s an artist that I did a deal with that I’ve been working with for seven or eight years now. Amazingly talented, he plays every instrument. He’s just somebody who I’ve been investing a lot of time into and effort and energy over the last seven years. So I’m excited for the world to hear that record, “Inevitable.” And then you know Zara Larsson. Her voice is so amazing and she’s so talented. I really, really love how she puts Sweden on the map, you know? On a completely different topic, can I ask about Kelly Rowland’s “Work”? I always loved that song. Oh, wow. That was like, what, 2006 or 2007? It was a hit in the UK and I don’t think it made it to America. It was just one of those songs I did with Scott Storch. Kelly and I loved it. When we started, I felt like it was hot. I definitely didn’t think it would come out anywhere. I thought it would just be on her album but it went top 10 in the UK. I didn’t expect that and it was just one of those things. You just make records that you love and I hope that everyone else feels the same feeling I get. Who are you in the studio with at the moment? I’m in with Mariah Carey, so we’re about seven or eight records in. I just did a couple new things with J.Lo, and then also, my little brother… there’s an album coming soon. That’s all I can say. Thank you so much for interviewing me. I appreciate you. How did you discover Poo Bear’s music? Let us know below, or by hitting us up on Facebook and Twitter!